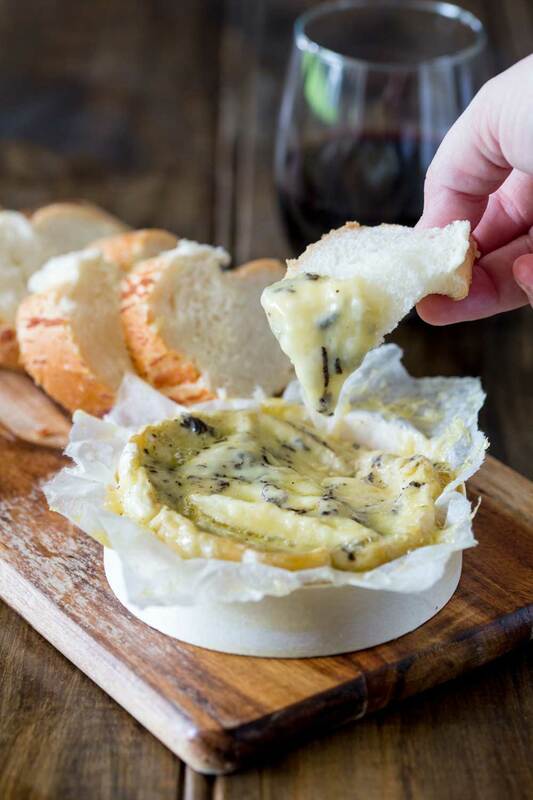 Creamy brie, enhanced with the earthy delicious flavours of black truffle all baked to oozing delicious perfection! 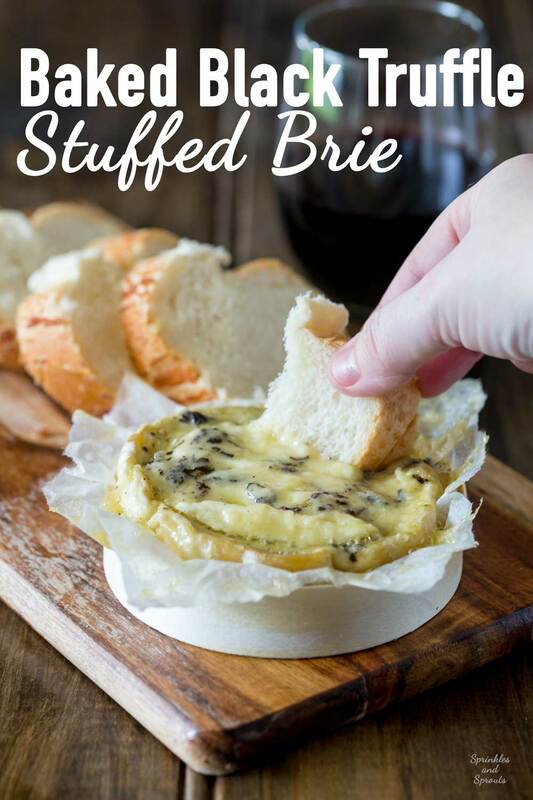 Seriously this Baked Black Truffle Stuffed Brie is decadence and heaven on a plate! Are you on a diet? If so it might be time to turn away! Because this is pure unadulterated cheese indulgence!!! Look at that oozingly delicious brie….don’t you wish you could steal the bread from my hand? If you read my black truffle stuffed roast chicken post from the other day you’ll know that a while ago I got sent some amazing Manjimup black truffles and that I have been enjoying the decadence of truffle dishes! Todays recipe is one of my total favourites ever!!! This used to be on the menu at the restaurant as a shared appetiser for 2. But I think you have to really love that other person….it would be too easy to just knock their hand out of the way and eat this all yourself 😉 I promise I didn’t do that!!! Stew had more than his fair share of this one! I am just too nice!!! 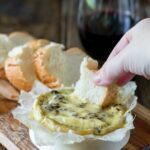 Baked brie is one of our family favourites, and I have a great recipe for it, it isn’t on the blog as trying to stop the boys dunking french bread into my garlic, rosemary and white wine baked brie is like trying to keep them quiet! it is pretty much impossible! I will get it up here one day….perhaps I’ll cook it up for lunch with my girlfriends….they may have slightly more patience…maybe???? but at least I can pacify them with martinis!!!! So oozing melty brie filled with earthy truffles. Decadent, delicious and super simple. Now if that isn’t a date night dinner delight then I don’t know what is! Seriously, get the brie in the oven, cut some bread and pour the wine. 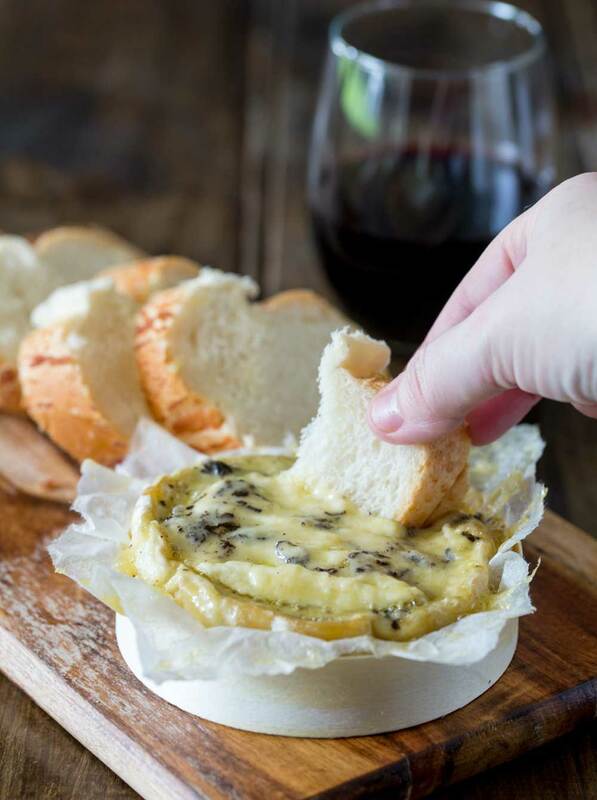 Drink the wine, dip the bread and smile happily at how much better life is when you have melted cheese! 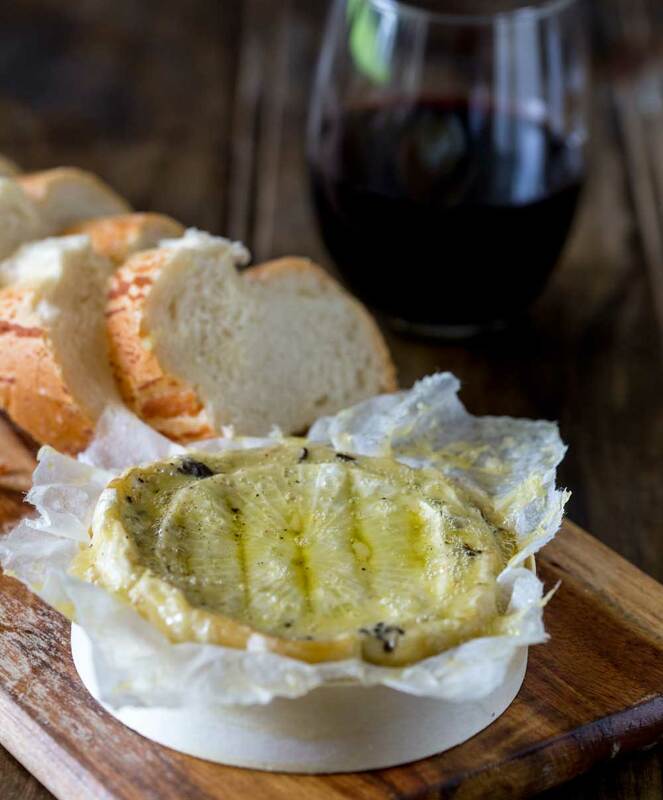 If you love this recipe for Baked Black Truffle Stuffed Brie why not subscribe to my newsletter, then you can have delicious recipes straight into your inbox. What is more, as a thank you I will send you my soup ebook for FREE! 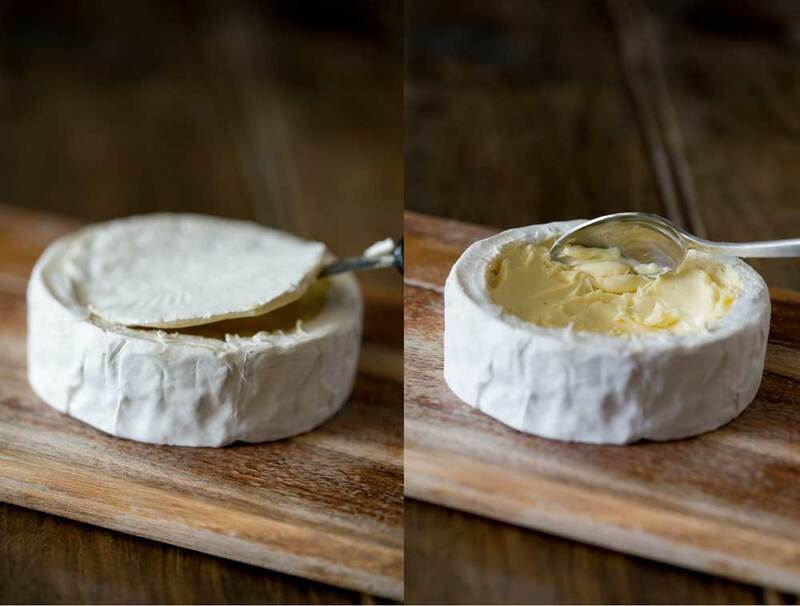 Remove all the packaging from your brie, but if it came in a wooden box keep this for later. Use a sharp knife to cut a circle in the top of your brie. You want to go through the rind and a little into the cheese. Finely grate the truffle over the cheese, drizzle over the olive oil and add a good pinch of salt and pepper. Wrap the brie in cooking paper and then tightly in tinfoil. Place the brie on a baking sheet and bake for 15-20 minutes until completely molten. Serve with plenty of bread and some apple slices. Some little radishes are amazing with this, but ideally you want the 'french breakfast' radishes as they have a milder flavour. In France the cheese is often baked in the box. But you find that there the boxes are stapled together. Here in Australia the boxes are often glued, so the heat of the oven will pop the box open! Better to use tin foil and transfer to the box. Otherwise you might end up with a cheese flood!!! I have never eaten truffles but I think this looks like the best place to start. I think I ruined my keyboard with all of my drools. It really isn’t my fault — it’s all yours!! My heavens I have such a weakness for cheese and then you HAD to have wine in the background. Good heavens girl, are you trying to kill me and my computer?? Well, the recipe is definitely a keeper and my hubby will never understand why my laptop is on the blink. Have a great weekend. Cheese and wine are just the best aren’t they!!!!!!! If this doesn’t earn you brownie points then I don’t know what will!!! Mind you your recipe with garlic, rosemary and white wine sounds totally delicious too! Hehe, melted cheese is always a winner isn’t it! Hi Claire! Now I really want some truffles! Brie is one of my favorite cheeses! I can’t think of a better late afternoon snack with a glass (or two…) of wine and I’d gladly share with you! I can’t think of anything better than sharing a glass of wine (or two) and some brie with you Dorothy. Sounds like a great afternoon!! !